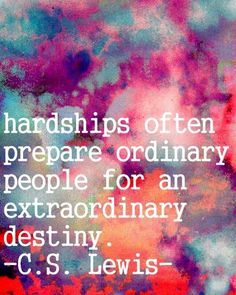 CS Lewis had it right when he spoke about “hardship.” As humans, we will all encounter difficult times-how we view these times and what we tell ourselves about our hardships is the most important aspect that will determine how hardship either helps us grow or stall. Research is showing us now that 90% of how we experience hardship is what we say to ourselves about that hardship and 10% is actually about the situation! This is where “perspective” is everything-the difference between an ordinary life and an extraordinary life!